Allah the Almighty has given all people all the necessary with which they can live and seek their livelihood to satisfy their needs. 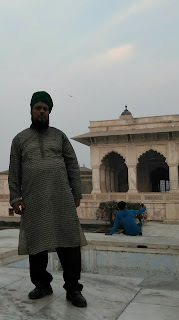 But sometimes the problem that crops up is the desire which man seeks to acquire/ fulfill through show-off and extravagance, which is way beyond his means, or he it may be that he can acquire it through the means which he has at hand but by foregoing something important from his budget. This kind of imbalance begins there itself, for very often he sets off to fulfill his desires to the detriment of much more important and essential things. Let us take a simple example so that we may understand this. A person can dress up in a convenient and simple way, in cheap clothes. But then he desires to clothe himself in haute couture or clothes of high class and made. This desire propels him to spend more. Thus, he needs to forego more essential needs such as food and drink only to satisfy this desire of his. He, therefore, makes some adjustments to his budget by cutting off essential needs. When we do this with a child who needs good/ quality food for his physical and mental development, we thus commit a grievous crime against our own child. How many are there among us who seek to borrow money only to clothe themselves in a fashionable way? And afterwards these kinds of people see it difficult to reimburse the money! (We call this "Israaf", i.e. bad spending). Thus, it is the children who have to bear the brunt because of the financial crisis in the house, and moreover disputes between spouses ensue. At the end of the day, it is the children who have to bear the consequences. This is how turbulence amidst the family and espousal units occur, all because of extravagant spending. We deprive ourselves from what we need and we go after what we do not need. In other words, extravagant spending is illicit (Haraam). Deen (Religion, i.e., Islam) teaches us moderation in all things. This applies to Ibaadat (prayer) also. We must make time for the accomplishment of our Ibaadat but we must not do it in such an excessive way as to neglect our other responsibilities or more important Ibaadat which are more essential. 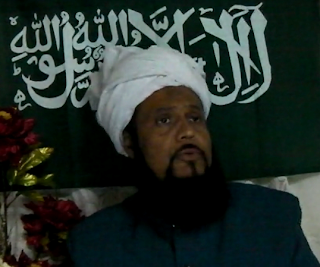 In his special address on the occasion of the Annual Conference of the Siraj Makin (sisters of the Jamaat Ul Sahih Al Islam International) at Mauritius on 14th August 2016, the Khalifatullah Hadhrat Munir Ahmad Azim Saheb (atba) spoke profoundly on the critical role of women in the Muslim family and social order. 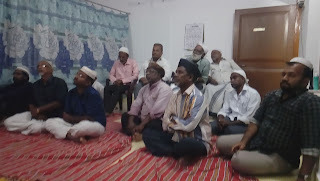 In the speech, Hadhrat Saheb (atba) draws our attention to the exceptional legacy of the inspirational, pious women ancestors of the Muslims at a time the world is virtually bereft of true spiritual role models to look up to and draw energy for engaging with the complex contingencies of our everyday life. Many of the women companions and disciples of the Holy Prophet (sa) were blessed with rare common sense and sense of perception, sound judgement and deep understanding, profound faith and courage of conviction. All these qualities helped them to take daring positions at the dawn of Islam's encounter with a decadent Meccan society. History chronicles that the wise opinions and bits of advice rendered by Ummul Mu'mineen Hadhrat Khadija (ra) has had great impact on her husband, the Holy Prophet (sa) at the most critical of the times of his Divine Mission so much so that the Prophet (sa) used to remember and miss her inspirational presence in his life, long after she was dead. 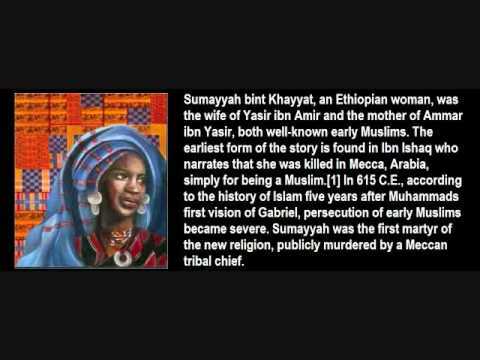 On the other hand, Hadhrat Sumayya (ra) became one of the first martyrs of Islam: bearing witness with her life to the deep conviction she has had in the enduring promise of Islam as the path to follow at all costs. On an everyday basis, it is a law of life that duties and rewards are attached to each one of us in our individual, family and social relations and the best outcomes depend upon the respective performance of the persons involved. Whether involved in the proper management of household affairs, or multi-tasking in a professional capacity, women today have manifold responsibilities. 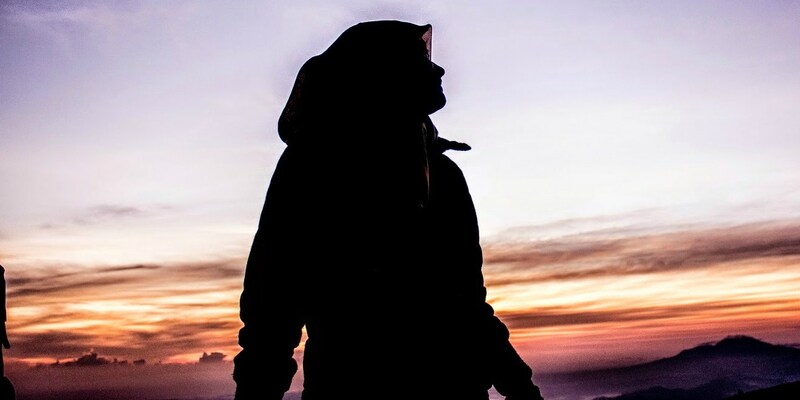 Success comes to those who are able to maintain and retain the fine balance over these diverging tasks and challenges, both in and out of the home. 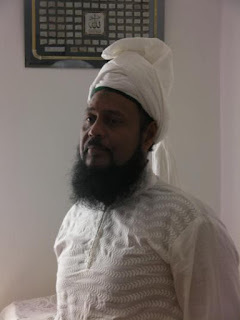 Hadhrat Saheb (atba) reminds all believers, including women, that it is through the proper discharge of one's duties and responsibilities at one's own level that each one of us can work for the larger goal of creating the conditions for the flourishing of true spirituality within us. 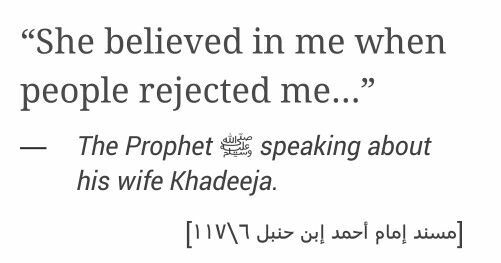 The mother of believers, Hadhrat Ummul Mumineen Khadija (ra) was a very perceptive woman. She knew perfectly the character of men. She knew how to recognise a precious metal and did not let herself be deceived by a ‘false painting’! Perhaps her work in commerce has formed in her that capacity, for, the traders are among the best connoisseurs of human psychology! 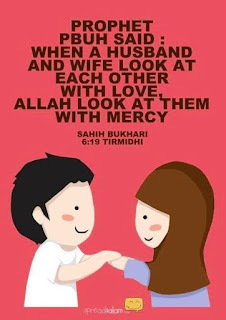 During her business dealings, she met Muhammad (pbuh) and asked him in marriage. Muhammad was not unknown to the Arabs. The nobility of his conduct was unanimously acknowledged and this won him much admiration. And it often happens that the nobility of the heart just like the brightness of the face is a basis for general assessment and is a thing which is approved by one and all. 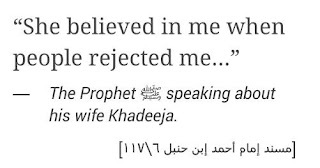 But after her marriage, Khadija (ra) got a better knowledge (and understanding) of her husband and realised the level of perfection he had achieved! So when he told her what had happened to him in the cave of Hira, she foretold him what shall happen (in the future) based on his own past. Khadija (ra) formed part of the high society of Quraysh, that is to say, the summit/ elite of Arab society. She was also the first woman to believe in his mission. But Islam is a universal religion destined for all social categories. If the hearts of the rich find therein an attraction, then the disadvantaged masses embrace it and expect much happiness from it. Masters and slaves occupy the same place. Thus Abu Bakr, the wealthy man embraced this religion like Bilal the freed slave. Certainly, Islam as a beautiful demonstration of gender equality has given their honourable place to the entire human race, regardless of their social status. Islam gives to man his true position in society and in the eyes of God. Therefore, there is no caste in Islam but rather a general brotherhood prevails. The slave and master both become the master of their destiny and share the same table and the same interests. If Khadija (ra) was the first believer and was part of the elites of Quraysh, certainly the first woman who received the honour of martyrdom (to die for the cause of God) was Sumayya, the mother of Ammar, who came from a poor and oppressed house, (one which is considered) without much value. The trials that God makes His servants undergo are varied. He tries some with fame and anonymity, some others with fortune and poverty, health and disease, and what counts is, the end. Then the leaders of Jaahiliyah (of the time of Ignorance who refused Islam) came to enjoy the public spectacle of torture. Among them was Abu Jahl who was angry at the sight of the woman’s courage and endurance in the face of such trial. He thus thrust a deadly spear low, in the area of her womb. She thus became the first martyr who fell for the sake of Islam. Then divine punishment was delayed for a long time until the day of the battle of Badr. That detestable Pharaoh (i.e., Abu Jahl) then went out to fight the believers and that’s when fate sent to him two Muslim teenagers who fought him until they triumphed over him and killed him! Certainly, Allah says in the Quran: “Indeed, We have sent to you a Messenger as a witness upon you just as We sent to Pharaoh a messenger. But Pharaoh disobeyed the messenger, so We seized him with a ruinous seizure.” (Al-Muzzammil 73: 16-17). May Allah welcome in His love these two precious Muslim women who, before the advent of Islam came from different social statuses but with the growing strength of Islam, they became both, two sisters of hearts who sacrificed their all for the triumph of truth in the whole of Arabia, and the world until our time and for all times to come until the Final Day. Ameen. The woman in her home is like a jewel that is well preserved in its case. She is the inspiration of her home, its manager and the one who highlights the value of life as a couple by cooperating with her husband to ensure the happiness of the family and the safety of the property/ wealth in her possession. I welcome therefore all housewives and women who for an important reason must go out to work and contribute to solving the financial problems of their homes. These women do not leave their homes as such, but they also perform their duties both in the home and in their professional fields. I bring before you today, ladies, an example of women among our pious predecessors who undertook to serve their home by doing all the work they could do for their husbands and children. This is part of the good ethics of life as a couple. This strengthens family life and allows it to perdure. “When Az-Zubayr married me, he had neither wealth, nor slave nor anything else like it, except a camel and a horse. 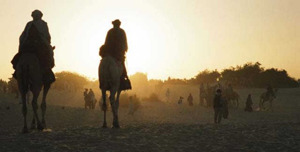 I used to graze his horse, provide fodder for it and look after it, and ground dates for his camel. Besides this, I grazed the camel, made arrangements for providing it with water and patched up his leather bucket and kneaded the flour. But I was not proficient in baking the bread, so my female neighbours of the Ansars used to bake bread for me and they were sincere women. And I used to carry on my head seeds (of dates) from Az-Zubayr’s land which the Messenger of Allah had endowed him, and it was at a distance of two miles (from Madina). As I was one-day carrying seeds upon my head I happened to meet the Messenger of Allah along with a group of his Companions. He called me and said to the camel to sit down so that he should make me ride behind him. I felt shy to go with men and I remembered Az-Zubayr and his sense of shame and jealousy. (And afterwards when Asma related this incident to her husband) Az-Zubayr replied: ‘By Allah, the carrying of such a burden (of date stones) upon your head is more severe a burden on me than riding with him.’ And I led this life of hardship until Abu Bakr sent afterwards a female servant who took upon herself the responsibility of looking after the horse and I felt as if she had emancipated me.’” (Bukhari & Muslim). Do you see how Asma bint Abu Bakr As-Siddiq (ra) has behaved? She did goodness and was rewarded with goodness. So be good by working for your home as much as you can, and you will find with Allah a great reward for it. The housewife takes care of her home. She is the equal of her husband who leaves for work outside in order to meet the family’s needs. While her husband works outside the home to feed the household, the woman is the silent strength and example of patience in order to tackle the enormous task of caring for her household. Couples who both need to go out of the house to work, for their part have a double share of responsibilities regarding their working lives, their homes, their children and themselves. They have the dual task of managing their home and their professional occupations. Household tasks are not reserved exclusively for ladies. The whole household must contribute to the development of their daily lives by participating in the many tasks that the home demands from a family. Our beloved prophet Muhammad (pbuh) was the example of the perfect husband and he was a perfect contributor to the happiness of his home because he had more than one wife. 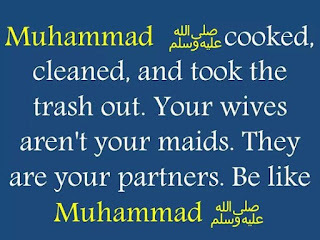 He helped his wives with the housework, advised them in good and lived in harmony with them. 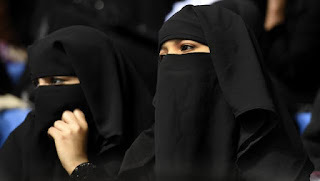 He always advised them, as well as his daughters and other believers to take good care of their homes, as this is certainly a Jihad (holy effort/ holy war) for them and their reward will certainly be huge with Allah if they conform to obedience to their husband and help in proper functioning of their homes. 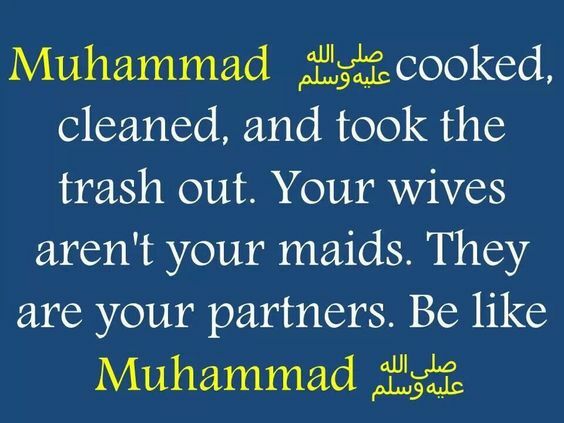 May Allah help you and the Muslim women around the world to become benevolent guardians for your homes and may He inspire the desire in you to serve His cause by being faithful to your duties as a Muslim woman and to contribute to the flourishing of Islam, the focus/ home of the true servants of Allah. Insha-Allah, Ameen. A man usually needs his well-being, and he verily cannot get it by himself. Even a king cannot acquire his well-being on his own. He does not become king on his own. He becomes king through people. If there are no people, then what shall the king do? It is a fact that a king very much needs people for his well-being. Someone in Africa or in the wild can seek means and ways to survive, to live his life, but this is not the case for a king. (He is so accustomed to being served by people that) If ever he has to seek a means of livelihood on his own, he shall be able to do so except with much difficulty. Therefore, a king needs people more for his well-being than an ordinary person. And an ordinary person needs others more than a very poor person. This means that in this temporal world, to seek our well-being, we need other people. That is why we observe that generally speaking, a person seeks means which shall provide for his comfort. If he is famished and thirsty, he seeks food and drink. If he does not have any money, he seeks someone who has some to give him. If he is oppressed because he is alone, he seeks people who can come to his rescue. If he is sick, he seeks a doctor and takes medicines. All the means that a person seeks to depend on for his comfort are the most fragile of means. And these means are more fragile than a spiderweb if there is no divine help. It is indeed Allah who makes fire burn, and knife cut. Water also is under the control of Allah. Whenever Allah so wishes, rain falls. 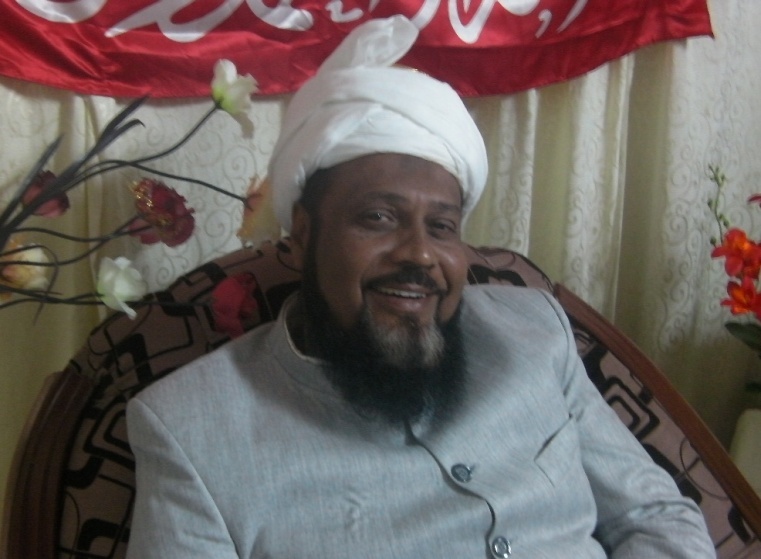 It is under the command of Allah that there is drought or cyclone. And it can happen that rain falls to an unexpected level. It is also Allah who gives the cure to people. A person (through the will of Allah) can get his cure in a simple concoction of herbs whereas others get healing by spending in medicines which are very expensive. Sometimes a person cannot get good sleep in his home which is well equipped with Air Conditioner and a comfortable bed whereas a poor man can get very good sleep even on rocks, straw or a simply broken bed. "The example of those who take allies other than Allah is like that of the spider who takes a home. And indeed, the weakest of homes is the home of the spider, if they only knew." (Al-Ankabut, 29: 42).